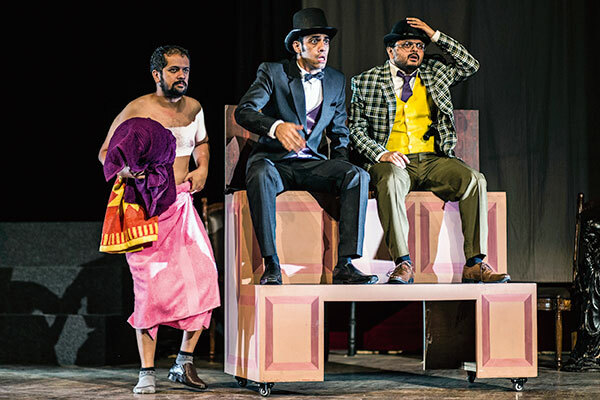 A comic presentation of The Hound of the Baskervilles brought the house down at the packed Jamshed Bhabha Theatre at the NCPA in Mumbai. Though purists may have squirmed to see the sharp, solemn detective of 221B Baker Street, Sherlock Holmes and his friend, the self-effacing Dr Watson being brought out of the closet in a wacky makeover, those who like an evening of fun and hilarity thoroughly enjoyed this version written by Steven Canny and John Nicholson, and directed by Akash Khurana, as part of the Aadyam theatre festival. Providing a riotous third angle to Holmes and Watson’s gay relationship is Sir Henry Baskerville, who the two have to protect from unknown, evil forces. The complications arising out of this ménage à trois create many a droll, and even a silly, moment in the play, heartily applauded by the audience. Certain explicit scenes done in a slapstick fashion take the viewers by surprise, giving rise to more laughter. Then, there is ‘the villain’ of the story — the naturalist, Mr Stapleton. In Sir Arthur Conan Doyle’s story, Stapleton passes off his wife as his sister to honeytrap his victims. Canny and Nicholson reinvent Stapleton’s wife/sister as a man in drag, and Sir Henry Baskerville helplessly gets attracted to her. This complicates the all-male relationships further, leading to more side-splitting laughter. Adding to the confusion is the fact that the actor who plays Sherlock Holmes plays Stapleton and his wife/sister as well. Keeping pace with the reticent Holmes, slipping in and out of multiple characters and costumes, playing a curvaceous, flirtatious, padded-up man one moment and a menacing, Spanish-accented, lame Stapleton in another, and then the pipe-smoking detective once again, he creates more rollicking entertainment. And the hound that hounded Baskerville is all but forgotten. What inspired you to stage a comic version of a murder mystery — making its lead actors gay, and peppering it with double entendres? This adaptation of The Hound of the Baskervilles celebrates a cult novel written over a century ago. I was particularly intrigued by the challenges the adaptation posed on the inventiveness of theatre artists, not just actors but designers, stage managers, wardrobe people and stagehands. Being backstage in a complex theatre production can be just as demanding (and gratifying) as entertaining audiences in the front. Split-second timing offstage is as necessary as the timing of the actors onstage. Our production tries to bring out this aspect of theatre and displays the usually unnoticed dexterity of creative artists.